When normal people prep to go somewhere, I imagine they write a nice list of all the clothing and toiletries they need to pack, are ready to go a week in advance, make sure there’s someone to take care of their home while they’re gone, drink a glass of wine for their nerves, drive around asking people for Grey Poupon, and so on. Luckily for me, I’m not a normal people. Sure, I have family to watch over my home, and my kids and cats will be safe and happy while I’m away. Beyond that though, my life is zany, and I really can’t stand the taste of wine (I’m a mixed drink girl). When I prep for a trip, I do two things. First, I overprepare. Second, I underprepare. But… but.. those two things don’t go together! Of course they do! Just think, how many times have you gotten somewhere just to realize that ONE thing that you REALLY needed but totally forgot? Oh yeah, now you get it. Part of me over preparing, especially for a Fan Faire–oh sorry… SOE Live—trip, is getting ready whatever crazy thing I’m bringing along to hand out (or amuse others with). This year’s project were Geek Badges. 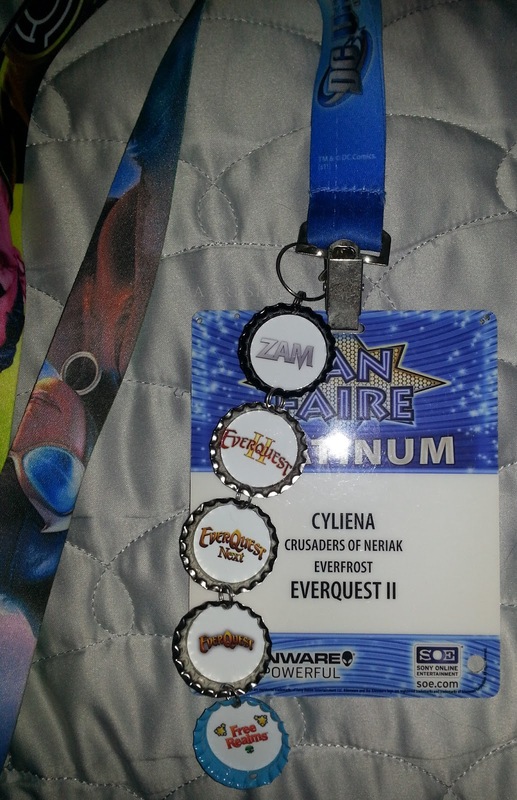 I guess they’d be better named “SOE Fangrrrrl Badges”, but geek sounded better. I’m almost done with them; there’s still two trays that I need to add the jump rings to. 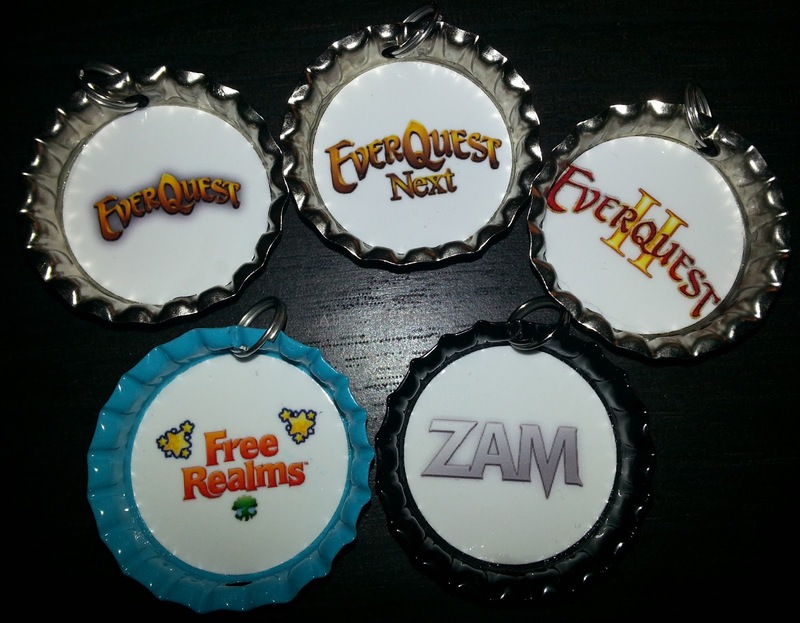 I made badges for ZAM (because I’m biased), EverQuest, EverQuest II, EverQuest Next (using Feldon of EQ2Wire‘s unofficial logo), and Free Realms. I know there’s other SOE games beyond that, but this year I was more focused on making ones that most of the people I’m familiar with would be interested in (sorry, DCUO, CWA, VG, and PS/PS2!). Some of these badges have already been requested by friends and others I plan on handing out to people who aren’t even aware I’ve been working on them yet. I made enough that there should be a good bit left over, so if you’re interested in one and are attending SOE Live, you are welcome to ask! They’ll have the smaller jump rings on them, so however you want to wear/attach them to you or your badge is in your hands. I suggest something versatile like a keyring (like I did in the picture above), safety pin, string, ribbon, etc. One question I’ve been asked by a couple of people is how much money I want for them. Well, I want zero money (my almost-six-year-old insists that “zero money” is valid terminology)! Two reasons: first, gifts are gifts, even if you ask for it, I made them as gifts, and have now openly offered them, because it was something fun to do. Second, and most important, every single logo (except Feldon’s EQ Next one) is property of SOE, and for obvious reasons I can’t make a profit off of that. However, I’ll gladly accept a thank you and a smile. Bonus points if you dance a little jig or recite Ice Ice Baby or something equally hilarious. I’m very excited to have something to share on a larger scale this year. Maybe I’ll even make Qho a mini-badge before heading out to Vegas (did you really think I’d leave Qho behind?!). Next PostStretch Goals Completed at EverQuestNext.com!